An endogenic-exogenic process is also an Earth-Sky relationship, if you're learning geoscience at the Diné Tribal College in New Mexico. This is one of three features on geoscience education that appear in the print edition of the September 2001 Geotimes. Join Geotimes associate editor Christina Reed in the Galapagos this month for her daily dispatches from an expedition to study undersea volcanoes. 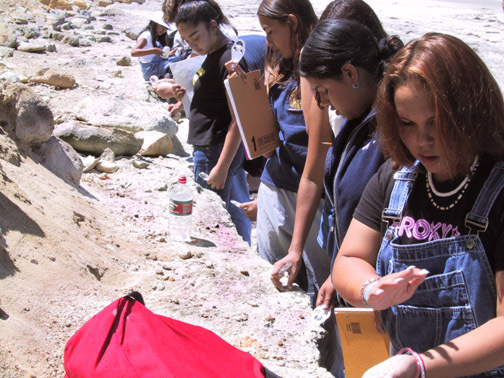 Texas has made a curriculum decision that is not good for earth science. The Senate passed an amendment on evolution in a major education bill. Did they know what they were doing? This overlooked sector can be a great place to launch a geoscience career. Students from Native American communities in California’s San Diego County take field notes near Scripps Pier, south of the Torrey Pines state reserve in San Diego. The students are part of the University of California at San Diego Early Academic Outreach Program. Photo by Marc Chavez, Native American Early Academic Outreach Coordinator for the University of California at San Diego. See the related story.